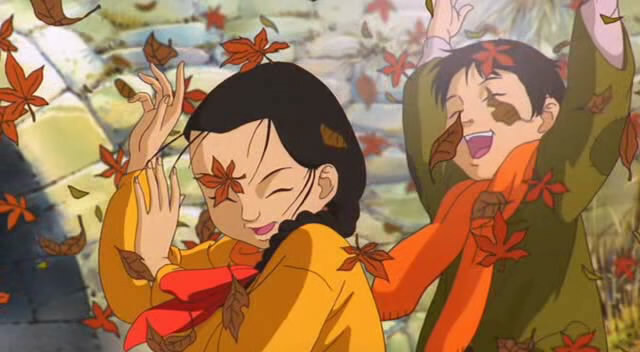 Like Mari Iyagi, Oseam is a miracle that sprang forth from the creative hands of Korean animators. Google for reviews and you’ll find it universally acclaimed by fans like psgels. Since he did such a splendid job describing the awesome that is Oseam, I will skip the reviewing part and offer a translation of Lee Jung Ho’s (producer) commentary as he has some really interesting stuff to say. But before that, a brief introduction to the original fable that inspired this wonderful film is due, by yours truly. You see, there lies a small Buddhist temple in the mountain of Sul Ak in Korea. 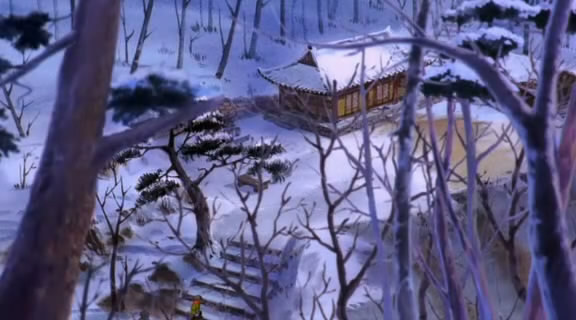 From this temple begins a beautifully tragic tale that has timelessly purified the heart of Korean people. 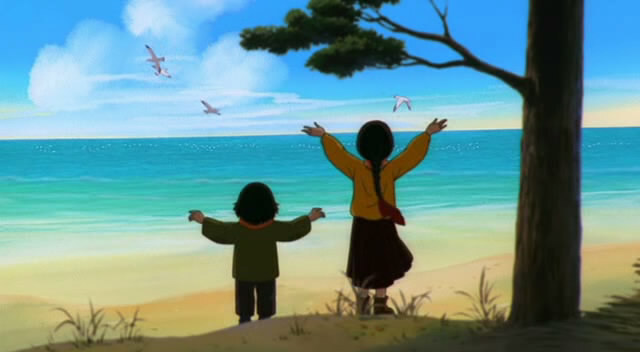 A five year old boy who journeys with his blind sister to find his lost mother. 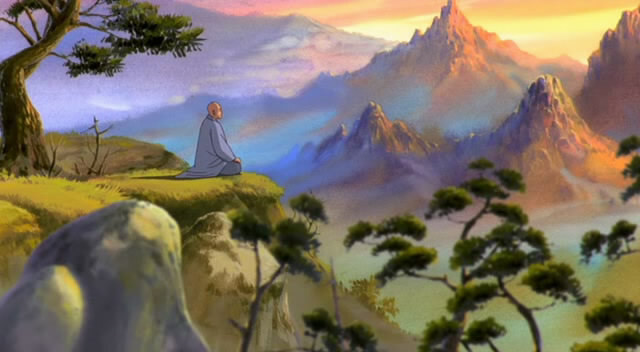 One day, he finds himself isolated in a small temple under the blizzard, without food, without fire. Just once, for just one day, if I could see my mother’s face again. This earnest prayer he made with a heart that is as pure as that clear spring lake. Later when his sister and a monk came to save the boy, a gentle rain began falling. Flowers of pretty colours decorated the mountain. Squirrels, rabbits and deers came to witness the miracle, as a small skylark ascended, as if to meet its kindred spirit in another world. People have since then named this temple Oseam, which literally means ‘Five year old temple’. 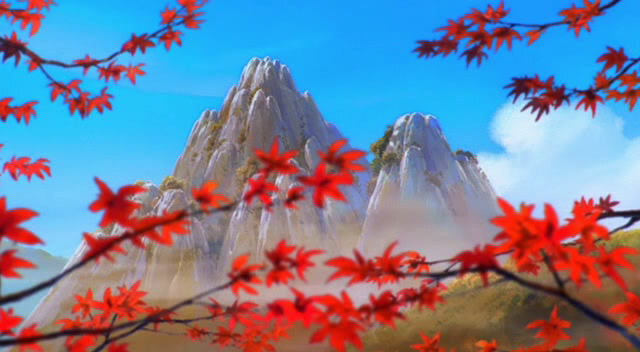 Rendered in lush and colourful art and animated in an effortlessly fluid manner, this is a tale of longing and purity. Oseam asks, do we still have that hope and purity of a five year old inside of us. Oseam asks, do we still have the heart to believe in the miracles. Oseam is the miraculous spring that moistens and warms our heart weathered by tough and harsh life we struggle in. Nowe we have that out of the way, here’s what the producer had to say about Oseam. Please note that I only translated the parts that I considered important to save your time reading, and mine translating. I also added my own musings in italics because it is a flawless logic that everyone likes my opinions. Q: What was the purpose behind producing Oseam? A: As I grew more confident in my belief in the demand for more family oriented animation, Oseam was produced to entertain people of all ages to enjoy as a family. 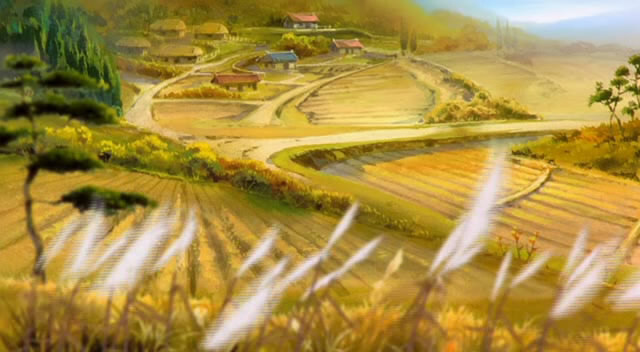 The production angle was to bring together parents and children, and uncles and aunts and all family members, to watch a family Korean animation together. In another words, I wasn’t happy with how majority of animations today (I’m guessing he’s talking about anime in general) insist on cheap and instant gratification, which is separating children from parents, young from old. Oseam attempts to bridge that separation through a narrative at relaxed pace, and pure and warm feelings to appreciate the comforts of our life. I agree to some extent. Certainly there aren’t that many family oriented anime I can think of aside from Ghibli, and other wholesome movies like Tokikake. But I am happy with how anime is geared towards individual viewing. I think Disney is producing family products like Wall-E just fine. Q: What’s the meaning behind adapating a story of Oseam that already exists as a myth, fable, movie and musical? A: I saw it as an opportunity. 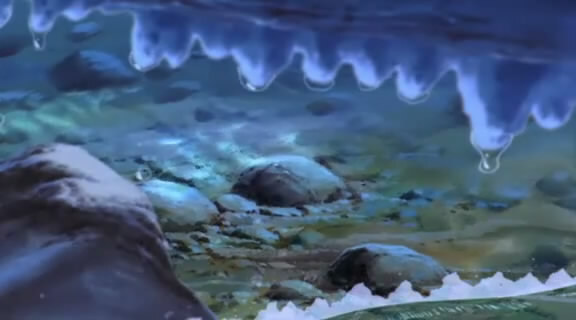 Unlike other mediums, Oseam the animation puts more emphasis on the mainstream appeal. Instead of religious themes, more emphasis is put on a five years old boy’s yearning for his mother. 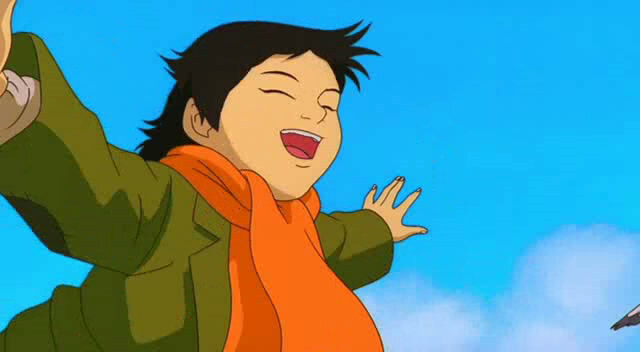 Unlike other mediums, I judged animation to be the most effective medium in expressing the boy’s personality and behaviour from his daily life, so our focus was on charming childlike qualities that can be drawn from that. I’d say the movie succeeded in doing that. Original fable is very much a wishful story, stuff of dreams. Oseam in comparison, is a more human and affectionate in its presentation. Q: Was there any difficulty in producing Oseam? A: Producing stage was the most daunting stage of creating Oseam. We tried to be humble in our budget, but that worked against us as investors wanted to see a fancy movie animated with heavy budget. Heavy focus was on creating characters and the setting that feels Korean, but that too was difficult as many animators only worked in American and Japanese industry. But, with the teamwork of staffs, we were able to overcome the obstacles and managed to create something distinctly Korean. We often overlook the nightmare behind the production of works. There are some anime that gives insight into these daunting production stages, Paranoia Agent and Hataraki Man for example. And I too applaud how they managed to animate something very Korean, from the character design, the whole autumn feel, the relaxed pacing. There is also that story reminiscent of Dog of Flanders (popular among Koreans), which I think deserves a post on its own sometime. A: I want Oseam to be a steady-seller. 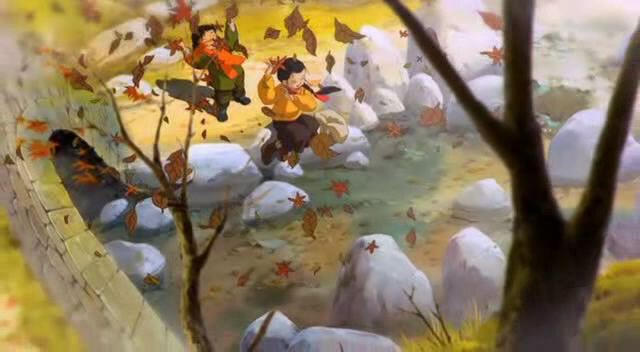 I want it to be featured in ‘Kid’s day’ (a Korean holiday) and other holidays as a classic animation. I don’t want people to simply compare Korean animation as a derivative of American or Japanese animation. Korean Cinema is internationally recognised today because of the audience participation. For our animation industry to also prevail, we need more love from the audience. I too wish that Korean animation industry can follow its Live Action counterpart and become internationally recognised as a creative force, not just a group of contractors cheaply hired to do boring in-betweens for American and Japanese animation. But I don’t have high hopes. If you’ve been following Iwa ni Hana, Chinese industry certainly seems to already have started nurturing their young talents, which unfortunately isn’t the case for Korea. I also want to mention how beautiful these screenshots depict autumn and winter seasons of our mountains. Just gorgeous. I saw this movie quite awhile ago and I LOVED it. The siblings were both brilliant characters, portraying their childlike qualities and also their burdens wonderfully, without ever feeling forced. 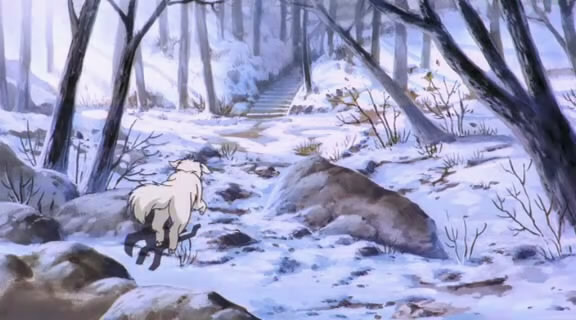 One of my favourite anime films along with Angel’s Egg and Only Yesterday. Hey Angel’s Egg is my favourite film too! Oseam isn’t one, but still pretty impressive film, especially considering its unique domestic feel. Angel’s Egg is amazing, it’s so stripped down and plain on the surface but it’s such a deep, meaningful piece of work. It’s the characters that make Oseam one of my favourites. Scenes like the one in the river were excellent, simple but effective.